In the cold waters of the Arctic, an inhabitant of the deep lurked for centuries. 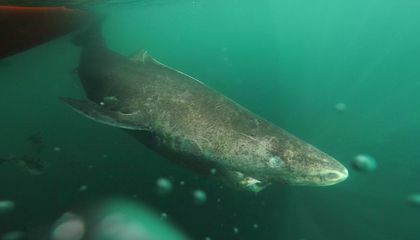 Now scientists calculate that this female Greenland shark was the Earth's oldest living animal with a backbone. They estimated that the gray shark, part of the species named after Greenland, was born in the icy waters roughly 400 years ago. It died only recently. That conclusion puts the entire species at the top of the longevity list. Using a novel dating technique, an international team of biologists and physicists estimated the age of 28 dead female Greenland sharks based on tissue in their eyes. Eight of the sharks were probably 200 years or older. Two likely date back more than three centuries, according to a study published in the journal Science. Until now, that record holder was a bowhead whale that hit 211 years old, according to study lead author Julius Nielsen and AnAge, an animal longevity database. 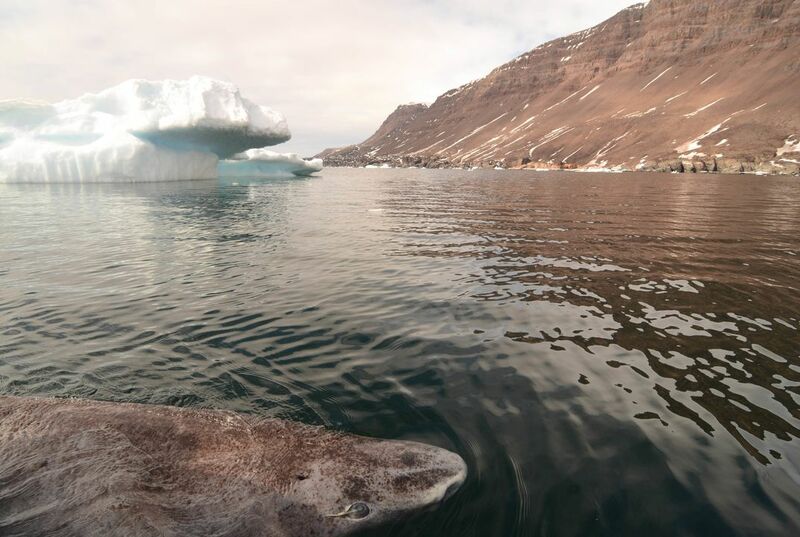 The oldest of the Greenland sharks examined was nearly 16.5-feet long and estimated to be 392 years old. It was caught around four years ago. But that calculation comes with a huge margin of error, plus or minus 120 years. This is due to the newness of the dating technique, said Nielsen, a marine biologist at the University of Copenhagen. "But the study is convincing enough for us to say that these animals live way longer than human beings and possibly longer than any other vertebrate," said Magalhaes. He runs the longevity database and wasn't part of Nielsen's team. "I don't know why they get as old, but I hope someone will find out," Nielsen said. For the age estimates, he uses a complex and indirect system. It combines chemical tracking, mathematical modeling and growth measurements. He focuses on the shark eye lens. Those form while the shark is still developing inside the mother's uterus and measures of carbon in them won't change after birth. It gives a good, rough sense of when the shark was born. I think it is fascinating that the oldest animal is a type of shark. I have never heard of a greenland shark, so this was all news to me. It's pretty awesome to read about this unique animal that is found in the oceans. In response to "The oldest living animal," I agree that this is true because they have proof of it and they have done research on it. One reason I agree is that the scientists said that they can measure the carbon in their eyes. Another reason is that the lower water temperatures create a slower metabolism extending their life time. It says in the article that they can live up to 200 years. A third reason is that they found 28 dead female greenland sharks. Even though some people think it is not real,I think it is. In response to "What is the oldest animal? ", I picked this article because I thought giant tortoise was the oldest living animal. I found out it was a Gray shark that ended up living for a total of 272 years. The Gray shark likes to live in very cold water. This is the oldest vertebrate, there are some invertebrates can live longer. One detail I learned is that, "the study is convincing enough for us to say that these animals live way longer than human beings and possibly longer than any other vertebrate". Another detail stated, "The cold water and the slow metabolism that comes with it might have something to do with their long lives ". A third detail " he wouldn't necessarily concentrate on exact numbers, especially when they exceed 400 years. Even though They don't know the exact date of the gray sharks death, I think even 300 years is legendary. When Cold and warm blooded animals live in cold they can live longer then if there were in warm water. It's said that the Greenland sharks love cold water. They prefer temperatures near freezing. i guess the cold water and the slow metabolism that supposedly "comes with it" could have something to do with how long they live. There are plenty of studies that show that cold temps promote longevity because the cold acts as a trigger for a gene receptor. I think it has something to do with an example like: a hot and cold cup of water drop food coloring in the cold water it moves pretty slow, but if you put food coloring in the warm water it'll move a lot faster. Because cold water is slow and the hot water is fast. think it has something to do with an example like: a hot and cold cup of water drop food coloring in the cold water it moves pretty slow, but if you put food coloring in the warm water it'll move a lot faster.